The name that Tim's given this upmarket site of his intrigues me, given that so much attention has been given over decades to the Welsh bluestones (about which more, nay, afterthought, less in a moment). Why the focus on the local sarsens (chemically silicified sandstone). Sure, they are the tallest most imposing feature of Stonehenge. But what else is special? The lintels obviously. But in all the discussion and speculation re Stonehenge (astronomical calendar, mortuary for the remains of the dead etc) I don't ever recall seeing any role proposed for those lintels! Why go to all that trouble in Neolithic or Bronze Age times? Surprising really, given those intricate and laboriously-carved woodworking joints (mortise and tenon, tongue and groove). I've given my own explanation on a few postings earlier for those sarsen lintels, aka transoms, aka crosspieces. Thanks Neil Wiseman for your response. But let's now be hearing some more sarsen-lintel focused ideas please! As regards the bluestones, I've now been able to fit them into my scheme, drawing on a property that I scoffed at initially on first encounter but which is now music to my ears. But that can wait. Come on folks! What's so special about those sarsens, apart from 'bigger is better'? I repeat: why go to all that trouble? It sure isn't anything to do with summer and winter solstices, for which aligned uprights alone are all that's needed. Oh dear. This site is turning out to be such a disappointment - so few comments, so little feedback, despite the informative and authoritative nature of Tim's postings. Don't get me started on some of the alternative sites - which invite comments, then tell one that the comment one has submitted must first be pre-moderated, that one is in a queue, but which finally never appears (with most other postings also devoid of any genuine-looking comments). There is much that is wrong right now as regards the received 'wisdom' regarding Stonehenge (read dogma) and stone circles, henges etc in general where the internet is concerned (I could say more, but will hold my tongue for now). It's getting on for 2 years since I last posted on Stonehenge/Silbury Hill on my own two sites - some 20 postings in all between 2012 and 2016. None - and I repeat none - have been picked up by any number of those dubious sites - even on comments - this one excluded. regarding the supposedly 'enigmatic' Shroud of Turin these last 6 years! Any chance of a guest posting on this site, one that briefly summarizes my near certainty that our Neolithic ancestors set great store, as well they might, by preliminary AFS (avian-assisted skeletonization) aka "sky burial" aka 'defleshing' aka excarnation as a preliminary to final bone cremation? Those massive sarsen lintels were the high point of AFS evolution and technology - monumental bird perches if the truth be told - designed to attract and retain the nearest the British Isles have to the Eurasian vulture - almost certainly the adaptable and voracious seagull! PS: That should have been avian-FACILITATED skeletonization (AFS). Apols for the glitch. The level of correspondence I receive is such that I cannot immediately reply to everyone. Apologies. I have little doubt that birds of various kinds participated in the excarnation process, it's probably key among the factors why the wickets were elevated. However, it is unlikely that the lintels at Stonehenge were set as a perch for birds waiting on queue to feed. If any consideration for this was given, I'm sure a simple post would have sufficed. Excarnation was part of a process which was virtually obsolete by the time the Sarsen Circle was erected. Interment had come firmly in vogue during this period and it wasn't long before cremation was discontinued altogether -- at least according to the record. Therefore it's speculative in the extreme that such a practice would be instituted by such a labor intensive program as these elaborate stone perches. Moving on, elsewhere you have mentioned a disagreement with the idea that Stonehenge was aligned to the sun. I have heard roofs. I have heard abattoirs. I have heard moats. I have heard Aliens, Pixies and Giants. I have heard it all. But nowhere have I heard that the sun was not among the prime motivations for constructing this monument. There were other motivations as well, though detailing them is beyond the scope of this little notice. Basically, the sun was at the rock-bottom of every element in a belief-system that spanned over 4,000 years. In fact, my friend, it still is -- we simply call it something else. 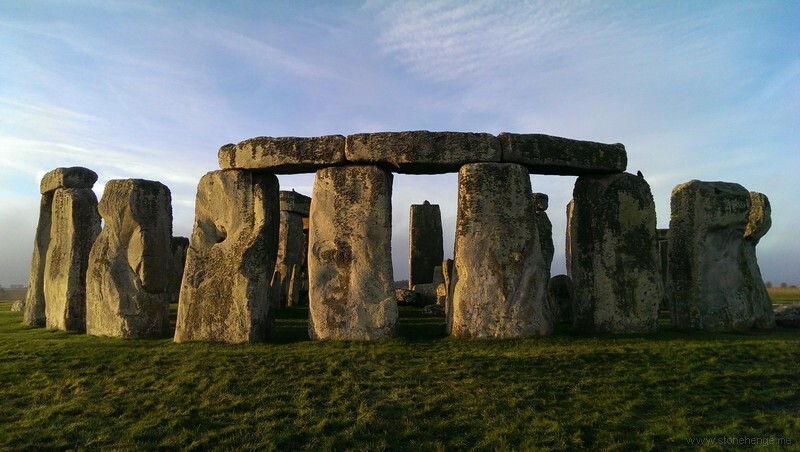 The Stonehenge stone-phase is at the tail end of that vastly long-lived culture and embraces a number of concepts which illustrate a firm understanding of how the world worked and the people's role in it. At that stage death played a peripheral mention. The Aubrey Holes had been forgotten and folks of status were being inhumed intact, complete with ceremonial grave-goods. As a footnote, I do agree that at least one type of lichen was no doubt delivered by bird. I respect your contribution to the subject, Neil, here and elsewhere, but can only repeat: there is a smooth continuum in terms of my proposed AFS model from causewayed enclosure to elevated sarsen lintel. We Brits had the bit between our teeth when we decided that neither whole body cremation nor whole body burial suited our view as to what was (then) practical, right or proper, and sought outside assistance, developing the pre-cremation 'sky burial' technology incrementally step by step over many centuries, indeed millennia. First those enclosures, then henges, then timber posts, then stone circles, then the crowning glory - Stonehenge. Once bronze then iron came along, replacing antler picks as efficient digging implements, then burial/inhumation became a year-round practical proposition. The reason for there being fewer deposits of cremated bone than might be expected is simple - the end-product was taken away by grieving relatives (unless celebrities interred in nearby long barrows etc). Ask yourself why there was cremated bone in the first instance- as distinct from cremated whole body. Ask yourself why the builders of Stonehenge went to the trouble of installing lintels, which I say were there as bird perches par excellence. Deny the hi-tech excarnation narrative, and you deny a huge chuck of our nation's history, and its early adoption of a particular funereal model, one that was 'appropriate technology' for the times, prior to metal digging implements or enclosed modern-day gas-fired crematoria. In other words, the role of compass location of gaps in the enclosure is linked to the Sun, but for reasons of illumination, rather than a solstice calendar. Later timber posts or standing stones would then have to be suitably aligned as well, so as not to block that early-morning shaft of sunlight. One can add a role for those bluestones as well. They clang/chime when struck, functioning as a Neolithic precursor of metal bells. I propose that the bluestones were "rung" whenever there was a new offering, attracting gulls from miles around. Astronomical calendar etc? Ingenious, but I'm reminded of that choice expression deployed by Sir Kenneth Clark in his "Civilization" TV series all those years ago ("false turnings and dissolving perspectives")! The Brits, as you call them, certainly dug a lot of trenches in the UK in the Neolithic. There’s over 900 causewayed enclosures and henges there, in Ireland, and even a few in France. That’s a lot of digging over a vast period of time. There’s several different varieties among both categories. A henge is generally defined as a single circular ditch with the spoil piled on the outside as an embankment. There’s usually at least one causeway in the circumference. Stonehenge is not, technically speaking, a henge, as its spoil is on the inside. I think of it as a Reversed Causewayed Enclosure. Whether cremations involved just skeletons or not is moot, and certainly relatives could have taken some of the ash away. But as anyone who’s had a relative cremated will tell you, a human doesn’t take up a lot of space. My mother and my brother sit on my mantle in tidy little urns. Inhumations of bodies are much more likely to have bones missing, and often do. Conservatively, Stonehenge has 250/300 people buried in or near the Aubreys and on the bank at certain locations, making it the largest known Neolithic cemetery on the Island. But remember — some of the remains there are older than the henge itself, so must have been curated before being buried. The auroch skulls flanking the Southern Causeway are also older. Metal certainly made it easier to dig in the chalk, yes. The mostly unworked Heelstone is almost certainly a product of the immediate vicinity, and its solutional hole is probably very close by. In its nooks and crannies people see not only an eagle, but a dog, a moray eel, and a face among other things. Neither of us is the first to notice/mention it. The Slaughter Stone is probably local as well. I feel your AFS model could accommodate the sun, as the two are mutually exclusive. Bear in mind that I never mentioned the sun as a ‘calendar’. Though it certainly could have been, it was mostly the moon which was used. From the mid-Neolithic on the sun was celebrated for its life-giving properties, among other things. But earlier there seems to have been a fear associated with winter solstice. Would the sun return? There are several examples of a demonstration showing the people that it would, and I cite Newgrange as an elaborate case in point. Again, the scope of this thinking is very involved and cannot be detailed here. The cardinal directions played a different role in the scheme of things than they do today, though there’s certainly an overlap. But, by my reckoning, only South is clearly shown to play a role at Stonehenge, and this association does not involve the stones. I know of no enclosure where North is a causeway, but northeast is, because that’s the solstice direction. As far as sightlines and alignments are concerned, be advised that the Heelstone’s original setting actually blocked the sunrise. Where shadows fall also seems to have been important, and this is demonstrated in more than a few instances. The Bluestones served a much more important role than as dinner bells for birds. They are buried in the ground and do not ring when struck. They thud. I am usually loathe to use the term when discussing other people’s ideas, but in this case it's apt. The concept is ridiculous in the extreme. If anything to do with Sun or Moon, would there not have been a few markings on one or more stones, a point I raised earlier? There is also the more general point that pre-stone circle/pre-henge farmers, those growing crops especially, would/must have had some crude kind of calendar at their disposal, and such a calendar would not have required massive stonework or even timber or chalk bank construction to figure out where one was in the annual cycle of seasons. How? Imagine a farmer plonking down on a west-facing tree stump at the end of his working day, watching the sun set. He would be aware that the Sun sets progressively northwards up to a certain part of the year, with the longest day/shortest night , then stops, then moves back until reaching a new stop point much further south (80 degrees in modern terminology, i.e. the best part of a right angle). Suppose now he counted the number of nights between what we now call the summer and winter solstices, by making cuts on a branch, or dropping small flints into a clay pot. He'd have found there were a regular repeating pattern of approx 182 nights, give or take between the solstices. Already he'd have a notion not just of days and nights (obviously) but now, more importantly, of years as well. Months, notably lunar months? Yes, watching the phases of the Moon would serve, but why bother when it's the warming Sun and seasons that are crucial to crops? Suppose then, dispensing for now with the Moon, our farmer decided to sow seed at the halfway point between the shortest and longest day, what we now call the vernal or spring equinox (arriving March 20 this year). He could do that crudely, by waiting for the Sun to set halfway between the two solstices OR, if wishing to be more accurate, could have waited until he had 90 or so notches or flints. Why then go to the bother of constructing anything permanent simply to know where one is approximately in the passage of each new year when all that's needed is a clear view towards the westward horizon (or alternatively the east-facing one instead if preferring to make his observations first thing in the morning? What's all this got to do with causeways, henges, standing stones, Stonehenge one might ask? I say nothing whatsoever - absolutely nothing. They were designed for an entirely different purpose, to do with giving dear departed relatives a respectful but efficient send-off to the afterlife, one in which an intermediary role for local birdlife was quickly perceived and accomplished by degrees, culminating in those mighty sarsen lintels (bird perches)for which it's hard to see any obvious role where monitoring the annual seasons is concerned, or Sun or Moon worship etc etc. I say that the summer/winter solstice theory is a false connection, one that should have been dispensed with long ago for lack of corroborating evidence and displaying, dare one say, a degree of fanciful or wishful thinking. It tries to make our Neolithic ancestors seem more detached from the problems of everyday existence than was really the case (like where the next meal was coming from, or what to do when Aunt Dot suddenly keels over, the ground outside is rock hard, the firewood nearly used up etc). Thank goodness for communal organization, or the first blossoming thereof. (I'll return with a separate comment later re the claimed 'lithophonic' properties of Stonehenge's bluestones, once I've selected passages from that Royal College of Arts posting).
" Sonic or musical rocks are referred to as 'ringing rocks' or 'lithophones'. A significant percentage of the rocks on Carn Menyn (ed. Preseli Hills, Pembrokeshire, SW Wales) produce metallic sounds like bells, gongs or tin drums when struck with small hammerstones. Where suspected Neolithic quarries are located, there’s an even higher localised percentage. The Preseli village Maenclochog, which itself means bell or ringing stones, used bluestones as church bells until the eighteenth century. While the Preseli area has long known of lithophones, the L&P project has confirmed why so many Neolithic monuments exist in the region, and provided strong evidence that the sounds made the landscape sacred to Stone Age people. The study quantifies the comments of the British archeologist and early 'rock gong' pioneer, Bernard Fagg, who suspected there were ringing rocks on or around Preseli, and suggested the link between these and the sacredness of Neolithic monuments and landscapes. In July, English Heritage gave the L&P investigators unprecedented permission to acoustically test the bluestones at Stonehenge. Accompanied by archaeologists from Bournemouth and Bristol universities, the research team set to work testing the megaliths. They didn’t expect much, as lithophones require ‘resonant space’ – space, in which, sound waves have sufficient room to vibrate to produce the pure sounds that can be experienced on Carn Menyn. The bluestones at Stonehenge are set deep into the ground (some having been supported in concrete), which can also dampen acoustic potential. To the researchers’ surprise, however, having tested all the bluestones at the monument, several were found to make distinctive (if muted) sounds. This was a sure indication they would have been fully lithophonic if they'd had sufficient resonant space. Furthermore, a number of bluestones at Stonehenge show evidence of having been struck. This have been in order (sic) to create an acoustic environment, according to Wozencroft. A full understanding of the nature of these markings will require further archaeological investigations, however." Beware: what follows is pure speculation! Let's suppose, just suppose, that the Neolithic folk who had inhabited the Preseli hills had been under attack from invaders, say from the sea (just a few miles away) and decided to migrate eastwards. Suppose they had decided to take their "ringing" stones with them, for whatever purpose (with gull-attracting properties a possibility). It's said that some 500 years separate the quarrying of the bluestones and their arrival on Salisbury Plain (based on radiocarbon dating of accompanying charcoal etc from fires). Well, 500 years gives plenty of time for manual transport, by whatever means (lifting, dragging etc). Maybe the migrants moved eastwards a little a time, setting up their stones at every stop, each one a new albeit temporary home. Might they have been trailed initially by their "own" gulls etc, but later attracting local ones at each new stopping place, the latter also becoming attuned to the 'wake up' call each time the stones were struck to signal each new offering when there was a death in the family (correction, families). As you might imagine, there's quite a few people who troll Tim's Blog without commenting, and most are known to me. I have just received an extensive list of henges and circles which do indeed have north-facing causeways. So I stand corrected in that regard. "As you might imagine, there's quite a few people who troll Tim's Blog without commenting, and most are known to me"
Who might want to troll Tim's site, and how can they do so if they don't comment? I got an email concerning it. The remarks weren't made here. Just a quick note on possible logistics before this posting gets overlain with new ones (such a shame/annoyance that Blogger does not provide a "Latest Comments" list to all postings, past as well as present. The aim was to perform the entire process in a 36 - 48 hour time span. Day 1: body of deceased to be delivered after sunset. Necessary preliminaries (let's not discuss details) took place during hours of darkness. Day 2: prepared body placed on central spot shortly before dawn. Central zone then cleared of people. The bluestones were then struck, the chimes attracting gulls and /or other avian scavengers from miles around. The corpse was gradually stripped of most of its flesh throughout the daylight hours, at least at highly developed Stonehenge, Avebury etc, designed to attract and accommodate scores of scavenger birds. The soul of the deceased would be considered to have been released to the heavens ("sky burial"). Come dusk, the skeletal remains would be collected up and dispatched to a nearby crematorium, probably outside the excarnation area, possibly outside the circular heaped-up bank. Come nightfall, fires/pyres were lit, the largely-defleshed bones quickly and cleanly cremated, then later retrieved from the ashes. Day 3: Relatives arrived to collect and take away cremated bones. While they would be aware of flocks of birds on the wing, coming and going, and indeed take comfort from that, they would be spared the sight of the central feeding area, that being screened off by the raised bank of the enclosure. (Indeed Mark 1 AFS relied almost entirely on the chalk bank of a causewayed enclosure, both as a screen and a man-made landmark visible to birds from afar, maybe with a few scattered timber posts initially as additional perches, later progressing to standing stones, then those mighty lintels.) Yes, the latter weren't purely decorative - they served a purpose! Why so massive? Because that's all that was available nearby as bridging stone. Thus the carpentry joints needed to prevent unwieldy sarsen stones from rocking, as well as a proto-Ikea aid to idiot-proof assembly. Why all the animal bones - domestic and wild - to say nothing of that severed human skull? To be a workable proposition, the skeletonization would have to be speedy and efficient (relatives don't want to be kept waiting too long for their take-home package). That means attracting and retaining a sizeable population of avian scavengers so there's always a number of hopefuls on permanent standby - scores at least. What if there's a temporary halt in supply of mortal remains? Answer: one plugs the hiatus with animal remains, maybe feasting on the choicest parts before giving feathered friends the left-overs. Thus the connection between feasting, animal and human bones... Just don't ask about all those young pigs at the Durrington wintertime-feasting site! The funeral centre had to be paid for its services. But how, given there was no money in Neolithic times as a medium of exchange? Answer: you didn't just turn up with your deceased relative. You brought an animal as well - either from your herd if a farmer, or from hunting expeditions into the surrounding countryside. As I say, the mortuary attendants could feast initially on choicer cuts, maybe inviting the relatives and/or others to join them, and then use leftovers to ensure there was always something that would keep the avian scavengers on permanent standby. Your passion on this topic of your theory is obvious. It is however off-topic! If you can argue that this theory is fundamental to whether or not the tunnel should be built, then you will be on-topic and you might get a response from people - particularly anti-tunnel supporters - who would wish not only to use your arguments to support their case, but would also automatically promote your theory. So while I'm admittedly off-topic, there's no-one on-topic either. So I could rightly claim (? )to be doing the site a small favour merely by inserting a touch of controversy, maybe attracting a few extra visitors while not as far as I can see deterring new commentators far less distracting from any ongoing dialogue of which there is scarcely any to speak of. So come on, all you pro- and anti-tunnel supporters. Tim is going to some trouble to keep you informed and up-to-date. Supply some feedback please. Oh, and there is the overarching site focus, expressed in its title no less - sarsen.org. Much of my own AFS thesis is directed to providing a function for the sarsen lintels, on which conventional solstice alignment mantra remains strangely silent! Having slept on it, so to speak, I have come to a decision. I shall wait till Tim puts up his next posting, and, regardless of its topic, then and only then place a further comment here, on THIS same Feb 9 posting, delivering my less costly compromise solution to the A303 problem. That way no one can accuse me of attempting to interrupt, far less hijack, the site's current preoccupation (?) with my own ideas! Here's a link to a photograph I took in 2012 of traffic approaching Stonehenge from an easterly direction. (An advisory site says that one merely needs to deploy the HTML command "img" using square brackets, but that was refused when testing on my own site a few minutes ago)! There's a second one I was going to shown namely traffic filing directly past the slightly elevated site at a safe and sedate rubber-necking speed a mere 200 metres or so away, but on second thoughts I shan't bother with it. Everyone here knows the problem as regards the close proximity of Stonehenge and the major, most direct route across Salisbury Plain from London to the West Country. My cheap and cheerful solution will follow later in the day (well, cheap compared with that obscene £1.6 billion for the road tunnel). First, as a necessary preliminary, forget about any idea that cutting off all sights and sounds of road traffic guarantees a religious experience. It's not just that you'll be surrounded by scores, possibly hundreds of fellow sightseers. You'll be too preoccupied with thoughts about the staggering sum of money (over £40 for a family! )you've been required to part with to that ghastly cash-cow-milking machine that calls itself English Heritage, and for what? To be restricted to a roped-off path that does not allow you to get up really close to the main stones! There should be a two-tier entry system: free (except for car park) to those wishing to see their national heritage but willing to be allowed no closer than that path) OR a charge (say £5 per head) for those wishing to view the stones at close quarters (no touching etc). The monument merely needs to be screened-off from the never-ending flow of nearby passing traffic. But how "nearby"? Over what length of approaching and receding A303, taking into account the various rises and dips in the road? How can motorists know (legitimately) they are approaching, then passing close, to a world-famous site if it's then screened off closer-up so as to prevent a freebie rubber-necking view? (I suspect the distraction is caused as much - if not more - by the masses of wandering sightseers than by the stones per se!. It's the nature of the screening that is crucial, and I don't mean a subterranean tunnel that requires scooping out and disposing of thousands of tons of local geology (and probably archaeology too). Yes, an approx. two kilometre (approx 1.2 mile) stretch of A303 centred on the stone circle should be screened off so that sightseers do not see and hear road traffic at close quarters nor vice versa. Ideally the screening, coming from the Amesbury/London direction, should start at the top of the incline one sees in my photo. Initially I thought an avenue of trees might suffice for that downhill stretch, compared with the more expensive man-made screen that follows. But I quickly discarded that idea. Why? Because motorists and their passengers should be allowed a fleeting glimpse from afar (1 to 1.5 km) of the monument and allowed time to decide whether to call in for a visit, scheduled or otherwise. It's the next (2km) stretch that is crucial. It should advertise the site to road traffic, but not create a distraction. How? The manner of doing that could be opened up to national competition. My idea would be simple and reasonably cost-effective: set up a continuous solid screen, with a simple repeating painted frieze viewed from the road side, e.g. cartoon-like standing stones (no summer or winter solstices, and for now at any rate, no seagulls or other scavenging species). There should be a foam-filled cavity in the centre of the screen, chosen to cut down noise penetration. How should the opposite side look, as seen through the eyes of visitors? Again, invite suggestions from the public! My idea? It could be simply painted so as to match the colour of the turf, blotting out the view of the road and traffic with the bonus of that sound-insulation too. Can the screen be made a more attractive feature in its own right, without being too dominant? Maybe - like giving it a wavy top. How about a continuous line of slightly-angled mirrors, such that visitors get a reflection of themselves as minute figures against the standing stones, as if viewed from double the distance of separation, giving a better idea of the site's isolated location on one of Europe's largest stretches of chalk upland. (Yes, let's not forget the longer history of Salisbury Plain, stretching back to the Cretaceous era approx. 65-145 million years ago, when it was submerged seabed accumulating skeletal remains and later fossils of minute sea creatures). Cost? Suppose the screen cost a princely £2000/metre (conservative estimate). That's £4million for 2km. Compare with the cost of the tunnel (£1.6 billion). It's just 0.25% (1/400th if you prefer fractions). I know which quotation I prefer, speaking as someone who pays income tax on his State Pension. Is it any wonder we have one of the lowest State pensions among developed nations, when we are prepared to squander an astronomical £1.6 billion on a short stretch of A-road? OK, so maybe it's a bit too soon to expect feedback. Or there again, looking at the largely silent response to Tim's recent postings, one maybe can't expect any feedback, for any number of reasons upon which I don't intend to comment or speculate. I'll wait a few days, and if it's still "0 (further) comments" on this and Tim's next postings, then I may decide to resume my previous postings (some 25 in all) on Stonehenge and its Neolithic predecessors via one or other of two of my three blogsites (either dormant or addressing different issues since mid 2016! One is specifically focused on Stonehenge (and Silbury Hill), the other tackling any number of general science topics of current interest. this site, notably my own comments or those of others, then please say so now (though as an interactive blogger I reserve the right to quote comments appearing here without attribution to specific contributors). In a few days time, I'll add a new posting to one of my two sites (I have yet to decide which, each having it's pros and cons). It will be the first on Stonehenge and my pre-cremation 'sky burial' thesis since April/May 2016.